Life is too short to wash dishes by hand, why not use the time for something productive and let the best dishwashers clean all the dishes for you. If you are looking for a new dishwasher in the market, the process can be an intimidating one; especially if you are buying one for the first time. The moment you step into a store or browse for them on the internet, you will be given so many options to choose from that will be different, and at the same time, they will have similarities. With that said, if you are the first timer, then you are certainly going to have a hard time finding the best possible dishwasher for you, then this buying guide is going to help you pick the best viable option. We have already reviewed the best dishwashers in this article, and this buying guide is just there to help make things easier. Below, you will find some of the best dishwashers of 2019 that we have rounded up and reviewed for you. In addition to that, if you think you might have some issues buying the best possible dishwasher for you, we have a very handy buyer’s guide for you. Does not need any tools. Dishes come out without any streaks. The dishwasher of the future. Economic, environmentally concious, and beautiful. hOmeLabs is another company famous for their kitchen expertise and have been for a long time now. Since we were reviewing the best dishwashers; we thought we should look at what hOmeLabs has to offer. We are reviewing the hOmeLabs Compact Countertop Dishwasher; it is a portable, mini dishwasher that is small enough to comfortably sit on the countertop without any issues whatsoever. Additionally, it is pretty cohesive in design as well, so it will not make your kitchen look odd or anything even remotely close to that. As far as the features are concerned, all the dishwashers that we are reviewing are pretty good with features. User-Friendly: Over time, I have heard a lot of people talk to me about how dishwashers are becoming more and more difficult to use. 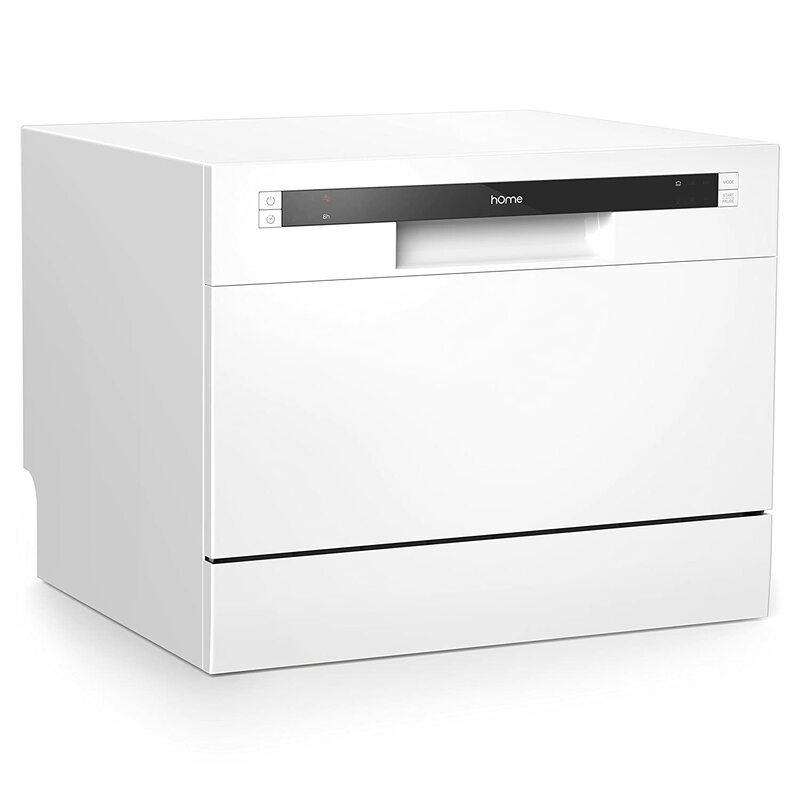 However, the good news about the hOmeLabs Compact Countertop Dishwasher is that it is user-friendly. Tool-Less Design: Another great thing about this particular dishwasher is its tool-less Everything is based on quick assembly, and disassembly, making the whole experience great. Small Form Factor: Small kitchens are still a thing, and if your kitchen is on the smaller side, this dishwasher will fit perfectly fine in your kitchen. What makes hOmeLabs the # 1 best seller in Countertop Dishwashers ? I have reviewed many dishwashers, and I can tell you when a dishwasher is good and when it is not. Using the hOmeLabs Compact Countertop Dishwasher has been a treat, it is user-friendly, super convenient for quick cleaning, and it comes with a plethora of accessories of its own. The dishwasher is lightweight and easy to move, has a nice sturdy nylon rack and most importantly it’s incredibly quiet. The digital display offers different cycles for running your dishes and they all work wonderfully. Additionally, if you are worried about streaks on your dishes, then the good news is that the hOmeLabs Compact Countertop Dishwasher offers streak-free cleaning, which is great because a lot of people have shown concerns over this issue beforehand. With that out of the way, there are no glaring issues with the hOmeLabs Compact Countertop Dishwasher. It is a pretty complete dishwasher, but it lacks in one area, dishes do not come out dry. But it’s not a big deal at all, to counter this issue you can simply open the door, and the dishes dry very quickly. It fits a decent amount of dishes, great for one or two people to use. Definitely not for larger families. Why are you still reading? Buy the thing! Easy to set-up, fits in small space. Dishes do not come out dry. Users can choose from six place settings. You can choose from six different wash cycles. Comes with a durable exterior and interior construction. Has a separate basket for silverware, and a dedicated dish rack. The dishwasher we are going to review comes from a company called SPT. Despite having a generic, confusion name. The good news is that the company has been around for a long time, and have been providing some great lifestyle products to their users. 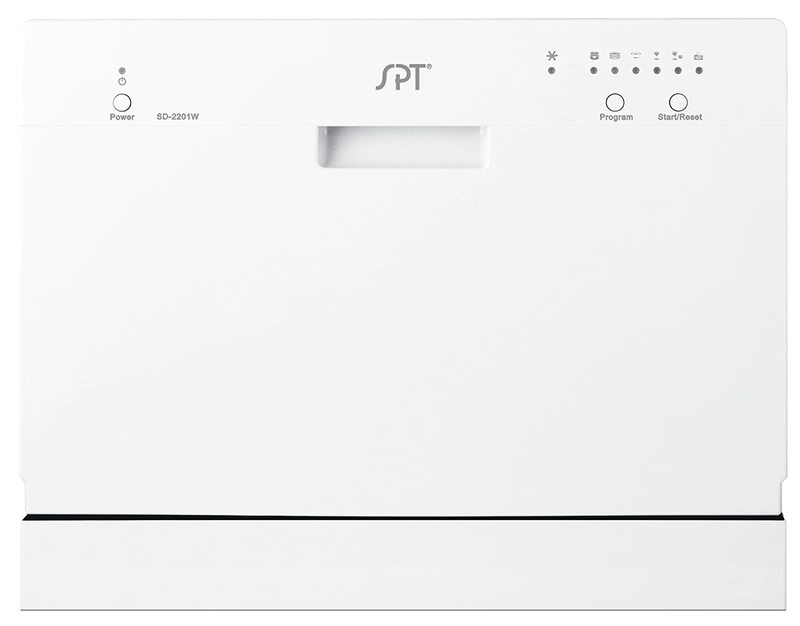 With that said, the model we are reviewing is the famous SPT SD-2201W Countertop Dishwasher. I love the countertop dishwashers because they can easily fit on most counters, and additionally, they are compact as well, and still manage to deliver a lot of power. The SPT SD-2201W that we have comes in white color and looks great with almost every interior. However, if you do want a different color option, the company does sell a silver color as well that should be more than enough for you. Size: The good news about the SPT SD-2201W is that it is a full sized dishwasher, meaning that you will not run into any issues as far as the size is concerned. A lot of people have voiced this before, but I can assure you that you will not run into any issues with the size. High Water Temperature: Another great thing about the SPT SD-2201W is that it reaches a maximum water temperature of 148 degrees Fahrenheit, which is pretty great for cleaning dishes with a lot of oily residue on them. Can Connect to Aerator Openings: The dishwasher does come with an adapter that allows you to connect it to the aerator openings. Easy to Use: The great thing about the SPT SD-2201W is that it happens to be one of the easiest to control. 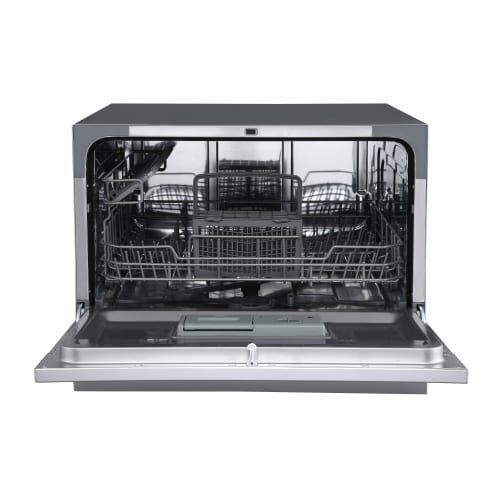 Those are some of the highlights of the SPT SD-2201W dishwasher; additionally, the great thing is that it comes with a stainless steel interior which is great because you will not have to worry about rust or any corrosion. You also get multiple wash cycles; a feature that is great when you thoroughly want to clean the dishes and does not create any issues whatsoever either. Lastly, one of my favorite things about the SPT SD-2201W is the fact that it can raise the water temperature to 148 degrees Fahrenheit. This temperature is best in situations when there is too much grease on the plates. The only two gripes I have with the dishwasher is the fact that it is a bit louder, and additionally, the dry cycle is on the weaker side. It’s perfect for apartments, office kitchens or any small-sized kitchens; offers full-size power in a compact design. With a height of only 17.24-inch, this dishwasher will fit between most countertop and cabinetry. In short, this is a beautiful countertop dishwasher, the value/functionality for the price, and the size and I would say it’s worth every penny! Perfect for two person households. Does not require fancy/new plumbing. Not the best choice for more than two people, if you only want to run it once a day (or less). Six place setting in a small package. Quiet operations at just 52 decibels. Compact enough to fit under a cabinet. Digital controls with dedicated LED display. Six wash cycles for granular cleaning controls. Next up, we are going to take a look at another excellent countertop dishwasher by the name Danby DDW621WDB. I know these dishwashers have odd names, but that is how things work with these companies. Is the Danby DDW621WDB a worthy dishwasher to be on the list? Let’s find out. The thing with most dishwashers in the market is that they are so similar to each other, it becomes a chore to distinguish them from one or the other. As far as the Danby DDW621WDB, it does come with some features that make it stand apart, but aside from that, almost all of it is mostly the same. Electronic Controls: While most of the dishwashers in the market are still using analog controls, the Danby DDW621WDB comes with electronic controls coupled with an LED screen for easier access. Reduced Water Consumption: If you are worried dishwasher consuming too much water, then the good news is that the Danby DDW621WDB comes with reduced water consumption. Stainless Steel Interior: I know it might be surprising to some of you as to how something like this can be a feature, but if you have used a steel interior before, you know that rust can be a huge issue. Detergent Support: If you want to ensure that your dishes are clean properly, then the good thing is that this dishwasher also supports detergent for maximum cleaning potential. Although you do get a lot of other features as well, the main highlights have been listed above. Additionally, I have to say that my time with the Danby DDW621WDB was an absolute treat. I mean, I have used dishwashers that had some major flaws, and comparatively, the Danby DDW621W is much better. However, that is not to say that there are no issues at all. During my use, I realized that there is no wash timer available on this dishwasher and this is odd considering how the dishwasher is packed with features. Additionally, another thing that I would like to address here is that you might need to rinse the dishes just a little bit before putting them into the dishwasher, this can be an inconvenience for a lot of people. What sets this model apart from other high range dishwashers? If you are looking for a quality dishwasher for an inexpensive price, look no further. The inside is stainless steel with plastic coated metal wire trays that seem very high quality. Cleaning quality is on par with $4-500 price range standard dishwashers. The water consumption is on the lower side. This is the only model with a heater built in. You can use all the detergents without any issue. The electronic controls and LED display are a blessing. You might have to rinse some dishes. Comes with a time delay feature. Solid interior made out of stainless steel. Connect it with ease using the included faucet adapter. You can adjust the upper rack to put larger plates or pots. Has six different washing programs for proper control over cleaning. SPT is back with another fantastic dishwasher offering that is going to be the grace of our list. SPT as a brand has been pretty consistent, and I love that about them. With that said, the SPT SD-9241SS is a great dishwasher, mainly because it is the smallest that I have reviewed so far. Do not let the size fool you though; it still comes with a great capacity that should make it fit for any small household. This dishwasher also happens to be one of the less boring options available in the market, thanks to the black and silver color. Not to forget, this dishwasher comes with small wheels on the bottom that will allow you to move it around. Time Delay: For a lot of people, this feature is an absolute treat because they do not have to worry about selecting a time. Multiple Washing Programs: If you are worried that you might not get the ideal results because of heavier dishes, don’t worry as the multiple washing programs should be enough. Stainless Steel Interior: SPT did not cut any corners, and included a great stainless steel interior to avoid any damage. Extremely Portable: Probably the biggest selling points of this dishwasher is the fact that it is incredibly portable, and can easily be moved around thanks to the wheels attached below. As far as the downsides are concerned, I did not find any major or minor flaws. However, I must tell you that the dishwasher does not dry dishes. Now it would have been an issue for a larger dishwasher, but considering the size of the SD-9241SS, it is more than understandable. You need to dry the dishes afterward, which I believe is perfectly fine if you have some time. 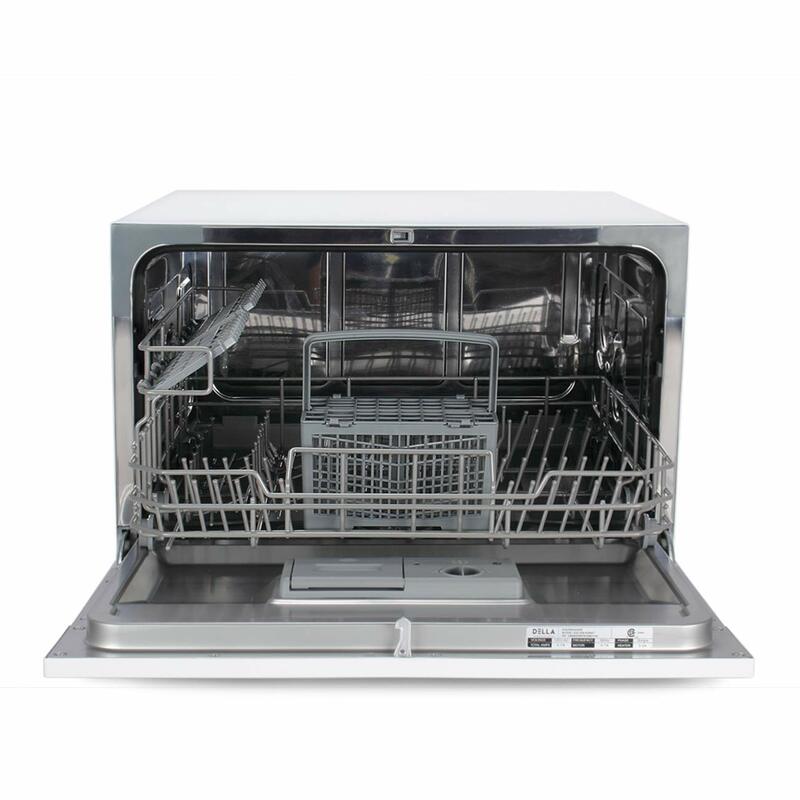 Why SPT SD-9241SS is the best and portable dishwasher? I have used some great SPT SD-9241SS dishwashers, but I have to tell you that as far as the portability is concerned, it is hard to beat the SD-9241SS. In conclusion, I love the SPT SD-9241SS simply because it is so small, and not just that, it does come with a list of features that people usually look for in a dishwasher. Small and portable, with wheels at the bottom. Can use detergents without any issue whatsoever. Due to a small size, the dishwasher does not dry dishes. Can hold larger plates with ease. Low noise level of just 52.3 decibels. Comes with stainless steel construction. Offers 7 wash cycles with 6 place setting. Has separate compartments for dishes, cusk, as well as cutlery. EdgeStar is a company that has been around for some time. They are known for producing some great appliances that people have been using for some time, and the best part is that they are packed with just the right amount of features to have people stick around. Today, we look at the EdgeStar DWP62SV 6; their countertop dishwasher that is small, easy to use, and most importantly, very efficient. Usually, when people are buying a good dishwasher, they do look for features as you would see in our buying guide at the end of the article. Built-in Water Heater: One of the best features of this dishwasher is the built-in water heater. Great for cleaning dishes with oily residue, harder to remove stains. Child Lock: If you are worried that children might tinker with the dishwasher, then there is a child lock that you can use to prevent that from happening. Digital Controls: You get granular digital controls with an LED display that is easy to read. Dish Dryer: The EdgeStar DWP62SV 6 comes with internal dish drying capabilities that ease up the job by a greater degree. Compact: Another great thing about the EdgeStar DWP62SV 6 is that it is one of the most compact dishwashers available. Very easy to carry around as well. Honestly, there are so many likable factors about the EdgeStar DWP62SV 6 that you would almost overlook the flaws if any. The 5-foot long hose, the LED display, along with the water heater, and not to mention, a good design are just some of the great things about this dishwasher. Not to mention, for those with kids who like to tinker with everything, there is a child lock available on the dishwasher that will prevent that from happening. Holds a decent amount for the size. The internal water heater is great. Digital controls and an easy to read LED display. Take up a lot of counter space . The interior is stainless steel. Digital controls, with a display. Comes with a delay start feature. Has a handy dispenser for detergent and rinse aid. You can remove the filters and clean them with ease. Comes with all the indicators for proper understanding. Magic Chef is a company who has been serving loyal customers for some time now. The good thing about them is that they are constantly trying to improve on what they are offering, and not just that, they are bringing some significant improvements. Today, we look at the Magic Chef MCSCD6W5 6. A 6 place setting countertop dishwasher that has been making some waves in the home appliance market. Now the good thing about this dishwasher is that it is incredibly easy to use with no complexities. With that out of the way, there are enough features to keep everyone occupied, and provide a great user experience as well. Easy to Maintain: The good thing about Magic Chef MCSCD6W5 6 is that it is easy to clean; the filters can easily be removed. 6 Place Settings: Just like any standard, high-end dishwasher, this one comes with a standard six place setting that should be more than enough for day to day use. Drying System: I believe that a dishwasher with a drying system is the one that I would consider complete. Thankfully, the Magic Chef MCSCD6W5 6 does come with one. Digital Controls and a Display: Most older dishwashers do not come with this feature, but the Magic Chef MCSCD6W5 6 has digital controls coupled with a good Led display that is clear to read. Above are some of the features about the Magic Chef MCSCD6W5 6 that I love. Additionally, you should know that the dishwasher is extremely compact and portable. During my testing, I also revealed that this is perhaps one of the most potent dishwashers available in the market. If you are worried that it might be a bit difficult to use, do not worry as the Magic Chef MCSCD6W5 6 comes with a comprehensive, yet easy to understand manual that should be enough to get the job done. There is one minor inconvenience that might bug some people; during my usage, I found out that the tub itself is not big enough for holding pans and pots. This might not be that big of an issue for some, but still, an important thing to point out. The Magic Chef MCSCD6W5 6 is a pretty fantastic dishwasher that should get the job done for most of the people looking for a good experience. Comes with five wash cycles. Modern design that looks great. Much larger on the inside than you would expect. Great performance regardless of the utensil types. The tub is not big enough for pots and pans. Comes with six different wash options. Has an automatic detergent and rinse aid dispenser. The upper basket can be adjusted to put larger dishes. You can install it quickly and easily with faucet dispenser. If you are wondering why SPT is such a famous company, there are all the right reasons behind that. 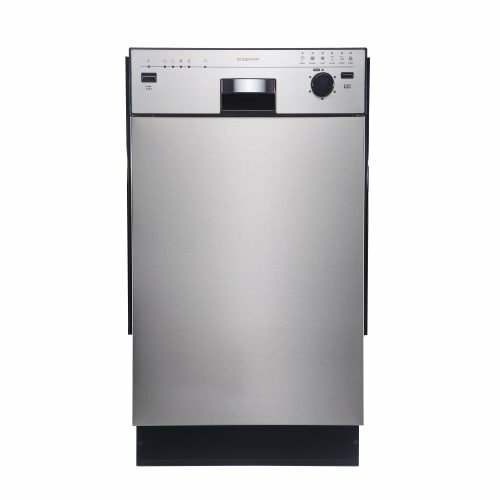 For starters, they have a great range of dishwashers, and while people do think that most dishwashers are mostly the same, that is not entirely the case, and you can see that with SPT SD-9241W. 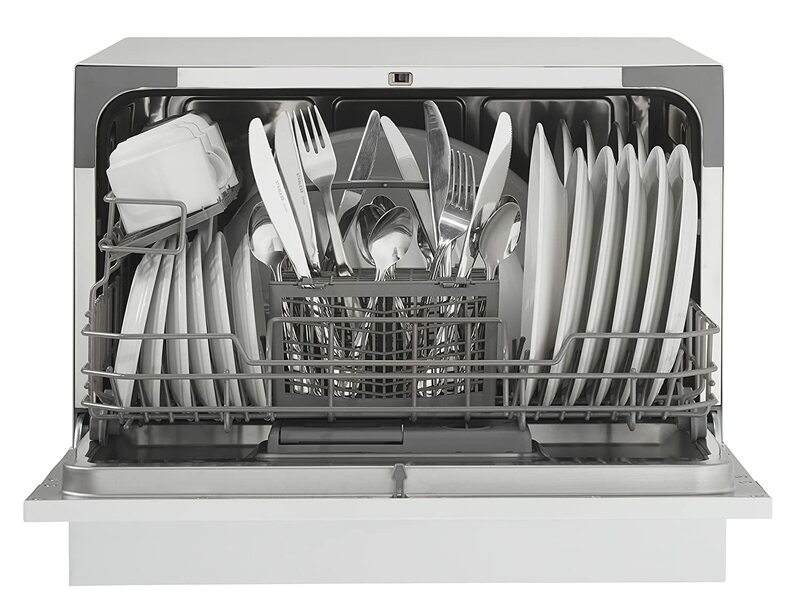 The SPT SD-9241W is an 18-inch dishwasher, which means that it is on the smaller side as compared to some of the counterparts. This is not a bad thing at all, as I have reviewed some of the best dishwashers that have been on the smaller side. Time Delay: This is perhaps a standard for the majority of dishwashers available in the market. The SPT SD-9241W uses a time delay feature that will allow you to adjust the time on your dishwasher. Adjustable Racks: Have larger than usual dishes that need more space? Do not worry as this dishwasher comes with adjustable racks that are there to help you put larger pans and pots into the dishwasher. Quick and Simple Installation: If you are worried that you might spend a lot of time installing the dishwasher, do not be, as it comes with adapters that are quick, simple, and easy to attach without much hassle. For starters, the connection that leads from drain to the faucet is on the smaller side, meaning that you will have to put the dishwasher closer. The SPT SD-9241W is excellent when it comes to installing as it is small and lightweight. You get six wash cycles that has become a standard for great dishwashers. One thing that I love about this dishwasher is the fact that it is very quiet when it comes to operating. It’s pretty fast when it comes to cleaning, providing you clean utensils in no time. 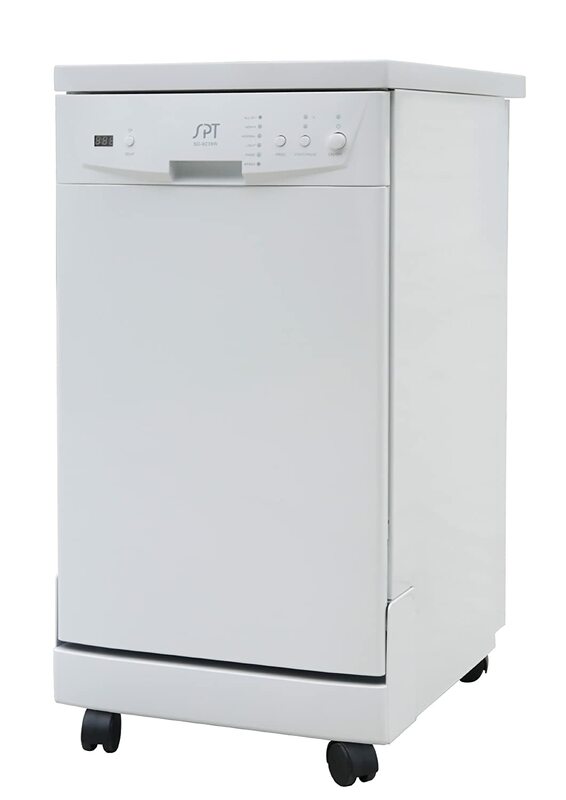 In conclusion, the SPT SD-9241W is a great, compact dishwasher that gets the job done for the majority of users. Can easily fit in tight spaces. Easy to move around without any issues. The faucet to drain connection is on the smaller side. The space on the lower rack is on the smaller side. Has a 4 level washing mechanism. Quiet operations at just 59 decibels. The interior is made out of high-quality stainless steel. Although we are closing into the last of the list, we still have some impressive products to look at. Just take a look at a company that is named Frigidaire; this is one of the best companies when it comes to home appliances and reviewing their dishwasher should be a treat. 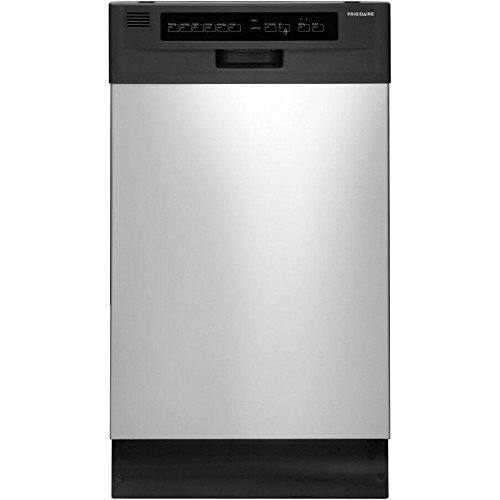 The model we are looking at right now is Frigidaire FFBD1821MS; a small and compact, 18-inch model that is built for people who want to move the dishwasher from one place to another easily. Additionally, the Frigidaire FFBD1821MS is a lot easier to use. Different Cleaning Methods: Whether you are washing utensils that need extra cleaning, or the ones that need light amount of cleaning; the Frigidaire FFBD1821MS comes with different cleaning methods. Removable Filter: Another redeeming feature of the Frigidaire FFBD1821MS is that it comes with a removable filter that you can quickly clean and without any issue. Portable: Thanks to its small size, the great thing about Frigidaire FFBD1821MS is that it is extremely easy to carry. So much so that you can easily place it anywhere, you want without any issues. There are some issues though; due to the small size of the dishwasher, if you have a larger family, or you use more utensils than usual, you might need a bigger option. Additionally, despite being relatively small, it is on the heavier side because of the interior and exterior being made out of stainless steel and not just plastic. Testing the Frigidaire FFBD1821MS has been an absolute joy, for starters, it fits without any issue in smaller kitchens. The interior and exterior of the dishwasher are made out of high-quality material, ensuring that there is no corrosion or rusting. I also noticed that the Frigidaire FFBD1821MS is very quiet, and only lets out a beep once the cleaning is done. Speaking of cleaning, it is fast and efficient and does leave any dirty spots on the utensils. You also have a feature that delays the start, something that is becoming more and more important. May be pricey for some users. Compact dishwasher for tight spaces. Comes with eight placement settings. Has a full set of controls for easier access. Six wash cycles allow you to wash the dishes with ease. We are gradually moving towards the end of the list, and there are still some fantastic dishwashers left to review. This is great because this way, we can give the readers more option to check out. As for right now, the EdgeStar is making a return with the EdgeStar BIDW1801SS. Now for those who do not know, the previous EdgeStar dishwasher that I reviewed was a full size. Large Capacity: Do not let the small size fool you as the EdgeStar BIDW1801SS comes with eight place setting as compared to the six place setting that is more common. Number of Wash Cycles: You also get a total of 6 wash cycles based on what type of utensils you are trying to wash. Enough Place: The dishwasher comes with two pull out racks for dishes, a basket for silverware, as well as a tray for cups. Aside from the view features that we have listed above, there are a lot of good things about the EdgeStar BIDW1801SS. For starters, the lightweight of the dishwasher makes it easy to carry around and store in whatever place you want. Additionally, it is cost effective thanks to premium construction and quality materials. You will not need to replace the machine in the future. It is also really easy to use for those wondering. There is no denying that this machine is an absolute champion when it comes to great performance, and more importantly, it offers a great price to performance ratio. There are some things about this dishwasher that are not good. For starters, despite the small size, the machine is not movable at all. Which means that once you do install it, there is no way to easily move it around without disconnecting it. Additionally, users who are looking to buy this machine will have to buy the dishwasher’s connection kit separately. This is a major let down considering how you are paying a good price for the machine, so you would expect it to have the best possible features, but it is sadly a letdown. All in all, the EdgeStar BIDW1801SS is a great dishwasher that is marred by some minor inconvenience that can be a problem for most of the buyers. However, let’s not forget that it Is still a very capable dishwasher that is well worth your money. You will have to buy the dishwasher’s connection kit separately. It is great for smaller kitchens. The dishwasher is easy to install. The controls are easy to understand. You can use it without having much knowledge. Solid build quality with a great interior made out of solid stainless steel. We are about done with the list, with the last dishwasher being from a company called DELLA. Now I know that it might sound strange to some, but the company has been producing some great products for the customers, and so far, has not disappointed anyone. Today, we look at the DELLA 032-DW-909WT. I know the name is long and possibly a challenge to remember, but we do have links for all the products we are reviewing. This makes things easier for people to just shop through this round up. Available in Three Colours: I know this is not a feature per say, but so many people have complained about how dishwashers are usually limited in colours. The DELLA 032-DW-909WT comes in white, silver, and black for the best possible choosing experience. Great for Small Kitchens: Thanks to its compact design, you can easily place it in a smaller kitchen and forget about space issues. User Friendly Controls: Although the controls are still analogue, the good thing about the DELLA 032-DW-909WT is that the controls are user friendly, and easily identifiable. To be honest, from the face alone, the DELLA 032-DW-909WT looks like a very simple dishwasher, and the one that does not have a lot of standout features. That might be true as well, especially when you consider the fact that dishwashers are slowly modernizing. But if one thing is for sure, then it is the fact that when it comes to sheer performance, the DELLA 032-DW-909WT is not easy to beat. As a matter of fact, it contains every single feature that people normally look for in a reliable dishwasher. 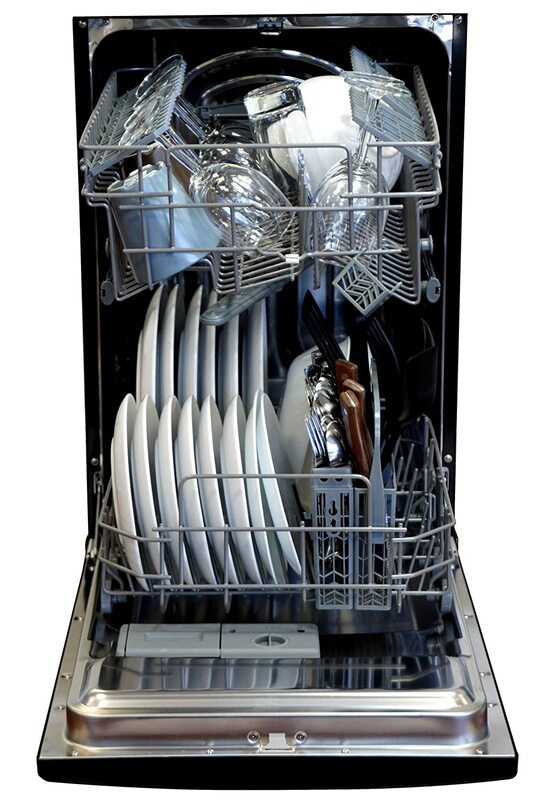 In conclusion, the DELLA 032-DW-909WT is a great option for those who are looking for an extremely practical dishwasher, but don’t mind a few setbacks. Cleans dishes without any issue. One of the biggest factors that you should be considering is the cleaning power of a dishwasher. Now the main thing that you need to know here is that the cleaning power of a dishwasher does not exponentially grow with the price of the dishwasher. You can see it clearly in our reviews that there are cheaper dishwashers that scored better in terms of cleaning as compared to some of the higher end ones. Therefore, yes, as far as the cleaning power is concerned, the best way to determine is by going through our reviews rather than telling yourself that if you spend more money, the dishwasher you are going to buy will be more powerful. Since the cleaning power is not price dependent, it also serves as good news, and it simply means that you will not have to spend a lot of money finding a dishwasher that has the best cleaning power. While the cleaning power of a dishwasher never directly correlates with the price; the noise level does. For anyone who is looking for a whisper quiet dishwasher, be prepared to spend more than you would on a cheaper dishwasher. However, there is a silver lining here, which means that the newer, entry level dishwashers are often quieter as compared to the ones that we have been used to. PRO TIP: The quietest dishwasher in our list is Magic Chef MCSCD6W5 as it operates quietly at 52 decibels to avoid disrupting other areas. To make things easier, we have made sure to mention the sound level of all the dishwashers we have reviewed, this will help you make the best possible purchase. In addition to that, you can also hit up the manufacturer’s website for the specific model, and check out the noise level of the specific dishwasher you are thinking of buying. The process is that easy. The lower end models that are available in the market have a sound rating in the 50-decibel range. These models cost between $400 to $500. Now the thing is that 50-decibel is not loud, to begin with, you can easily have a conversation in the room even when the dishwasher is on, and if you happen to have a sleeping baby nearby, we can assure you that there will not be any sleep disturbance. If you, your family, and friends have a habit of talking in the kitchen while doing the chores, then investing in a mid-range model would make more sense because, with this range, you will not have to worry about a lot of noise. The mid-range models run for around $600 and go all the way to $900, and as far as the sound rating is concerned, you get the 40-decibel sound range that you need to keep in mind. If you want an even better experience with the dishwasher, and you are looking for something that does not make a lot of noise, then the higher end options are even better. Sure, these cost you around $800 to $900 for the models that have a sound rating in their lower 40s, and if you cross into the 4-digit price range, then you can find models that have a sound rating in the high 30s. Indeed impressive, but they do come with a price tag. The cycles and speed is another important factor that needs to be put into consideration whenever you are buying a dishwasher. Regular/Standard: This type of cycle is perhaps the most common one when it comes to dishwashers; it is used for a full load of dishes that are moderately dirty. For our reviews, we used this cycle to determine the power, as well as the sound rating of the dishwashers. Express: This is most commonly used in situations where you do not have a lot of dishes that require cleaning, or when the dishes are not as dirty. 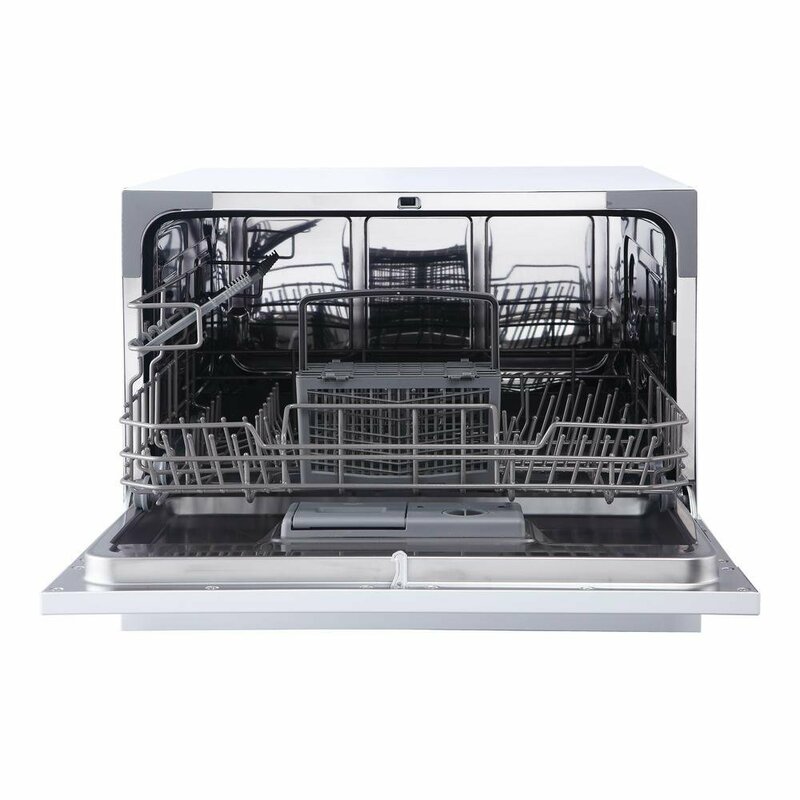 Auto: This is the best if you want to let the dishwasher do the work by using the sensors and determining the load of the dishes as well as just how dirty they are. Heavy: This cycle is best for dishes like pots as well as pans, but the good thing is that you can even use the ordinary dishes; especially the ones that are dirtier than your usual dishes. China: As the name suggests, this cycle uses water at a lesser pressure, and is best used for dishes that are fragile. Say fine china or wine glasses. Rinse Only: This is best if you have just taken the dishes out of the cupboard, and want to ensure that all the dust is rinsed off. Efficient: If you are worried about using a lot of water and energy, then you can opt for this mode. Sure, the dishwasher will take longer to clean as compared to the standard mode, but at least you will be saving both water and energy. The next thing that I would suggest you consider is the type of dishwasher; now when it comes to this; you have two options to go for. The standard size of the dishwasher is 24-inches wide, and this type of dishwasher is fixed in one place, and that is generally under the kitchen counter. This is the most standard type of dishwasher, and one of the main reasons why all the dishwashers look the same. However, if you are low on space, but you still want to invest in a dishwasher, then the good news is that you can go for a more compact option that is 18-inches wide. In addition to that, you can even find portable dishwashers that are with wheels and can move around, but they might cost you a bit more money as compared to the standard options that you have available in the market. I would suggest you to go for compact or portable dishwashers only if you are on limited space or looking for something different and unique. Otherwise, you should always opt for the bigger sizes. Another essential thing that I would suggest you to consider is the looks and finish of the dishwasher. Usually, you are going to find it in black, white, or the usual stainless steel. However, if you are tired of these finishes, then you can opt for something a bit more premium, however, expect to pay a bit higher for specialized finishes. As far as the style is concerned; you can opt for either the one with physical buttons or the more advanced models will have digital controls. Again, this is something that varies from model to model, and the price can be a determinant in both the style, as well as the finish. So, something that you must keep in mind. There is no denying that capacity of a dishwasher is one of the most critical factors that you have to consider when it comes to a dishwasher. Simply because if you end up buying a smaller capacity of the dishwasher, your whole experience might end up becoming more tedious. With that in mind, the critical thing that you need to know here is that even the standard 24-inch wide dishwasher will have a different capacity based on the model. The good news is that most of the websites have these listed so you will have no issues with that. In addition to that, every model that we have reviewed will have the capacity listed for your convenience. You use up to 27 gallons of water per load by hand versus as little as 3 gallons with an ENERGY STAR-rated dishwasher. I will be honest; testing the dishwashers to see which one is better than the other one is not an easy task. Considering how most of the dishwashers you look at are largely the same when it comes to functionality. However, the dishwashers working largely the same is not a bad thing at all. As they are still performing largely the same. This makes the whole process of testing the dishwashers all the more difficult. The good thing is that this roundup is exactly for that. With that out of the way, the purpose of this roundup was to ensure that whatever dishwasher you decide to go with does not create any troubles for you. That is the reason why we picked the best available in the market. Done with the dishwashers? Now, you can also use some good pressure washer to remove some dirt, grime quickly, and even paint that is chipping away.